For science this year, my kids chose to study botany. They sure thought they knew a lot about plants before we started this seed experiment. After all, we had grown grass seed and seen that plants grow best with dirt, but I think they neglected to notice that the seeds with just water grew nearly as fast. 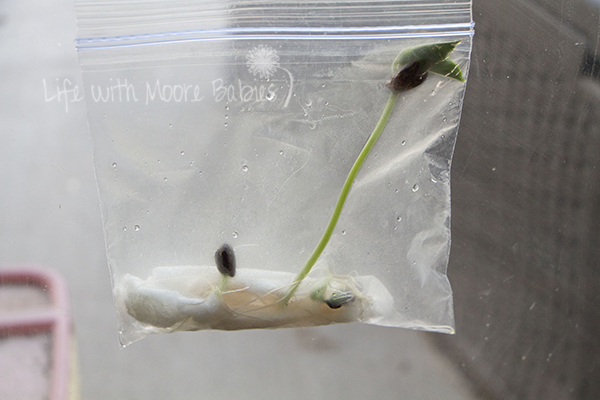 So, this experiment was to demonstrate not what plants need to grow, but only what seeds need to sprout. What do seeds need to sprout? As you can see from this list, a seed does not need the same things to germinate as a plant needs to grow and flourish. 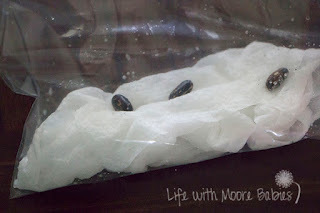 To demonstrate the needs of a seed we set up this little experiment with bean seeds. 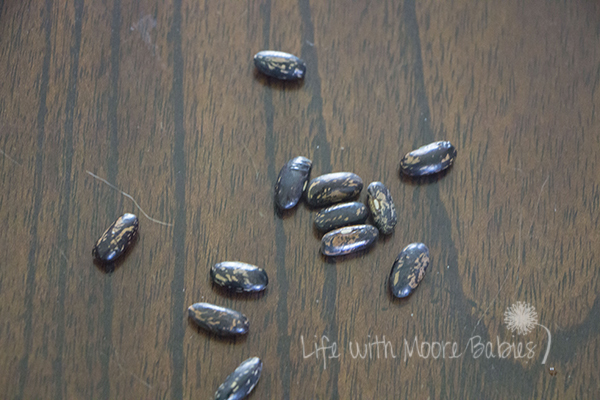 Bean seeds are ideal for growing with kids because they are large enough to handle easily and they grow quickly. To start with moisten one paper towel for each Ziploc bag, place in the bottom of the bag, and lay bean seeds on top. 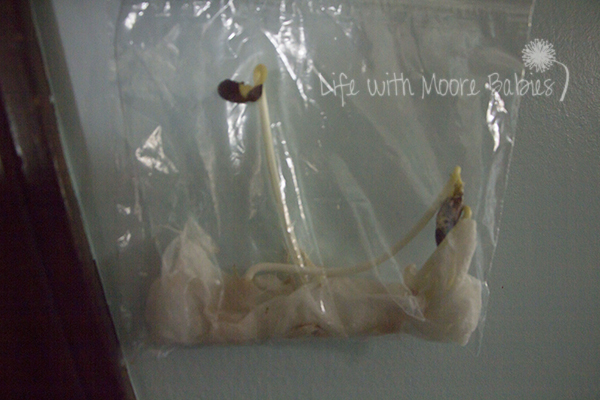 We grew three per bag to ensure at least one germinated. Now that your seed baggies are ready, you need to distribute them to locations with various growing conditions. 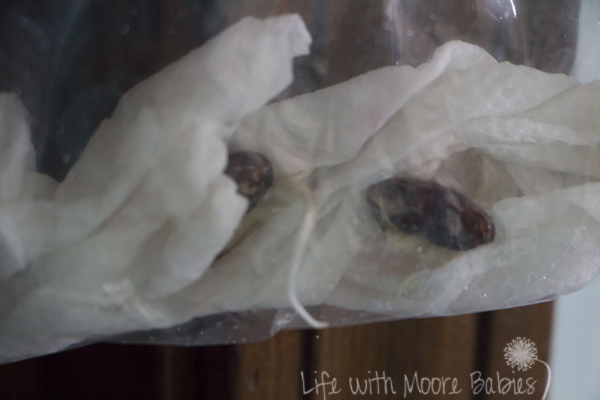 We taped one bag in a sunny window, one in the refrigerator, and one in a dark closet. 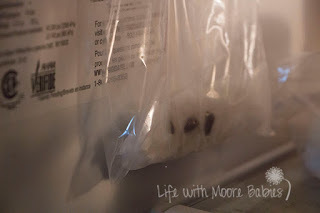 We checked and measured growth on each bag daily. 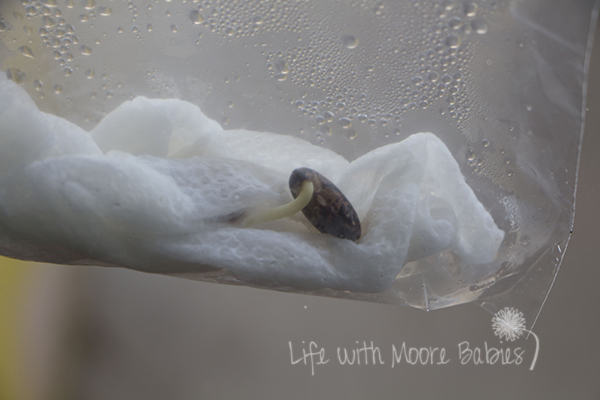 The seeds in the closet showed growth first followed shortly the seeds in the sunny window. The seedlings in the closet grew rapidly. Although my kids also noticed the bean plants in the closet were completely white. 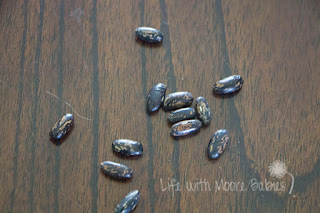 While the seedlingss in the window grew slower, they appeared more like normal bean plants including being green in color. Those in the refrigerator never grew. 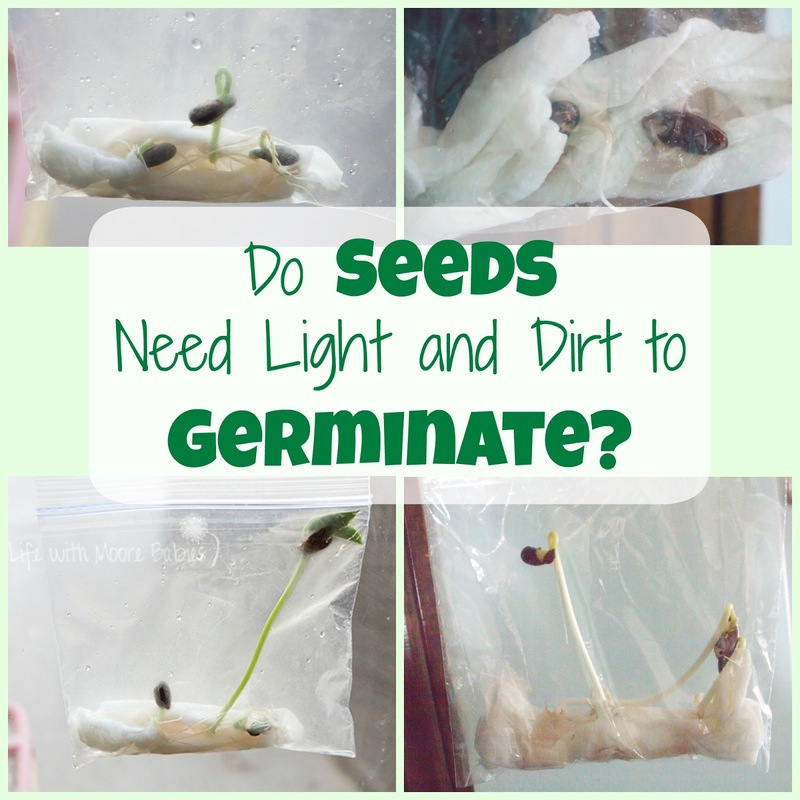 What caused the seeds to germinate differently? If you remember the needs of the seeds you can probably deduce why our seeds germinated the way they did. All the seeds had water, and all the seeds had air, so the only other need is warmth. The fact that the seeds in the refrigerator never germinated shows that they do indeed need warmth. 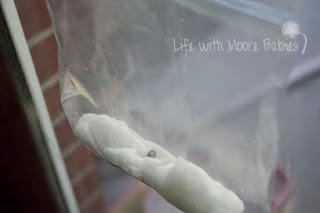 It seems likely to me that the seeds in the closet were a bit warmer since they were in the center of the house while those on the window were exposed to slightly cooler temperatures. This would explain why those in the closet sprouted faster, but we would have needed to check the temperature to confirm this hypothesis. The two bags that had all the requirements for seed germination (water, air, and warmth) did start growing. But why did we see the difference in plant growth? 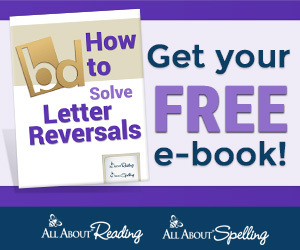 If you remember back to the needs of plants you might be able to figure out the answer to that as well. Plants need water, food, and light. The difference between these two bags was light. 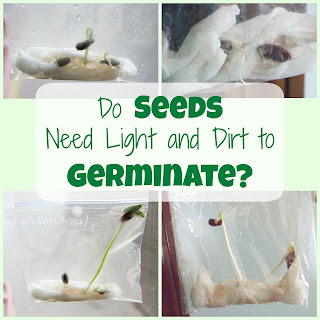 The seeds that germinated in the dark were searching for light. They grew quickly as they continued their hunt for light; they also remained white as the exposure to light is needed for chlorophyll to develop and give the plant its green color. 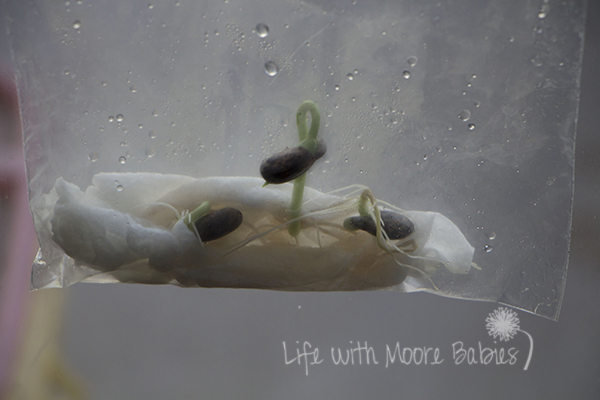 It took a bit of thought for my kids to justify the way the seeds did or did not germinate. This hands-on learning activity really helped cement the idea that seeds don't have the same requirements to germinate as plants do to grow, but if you provide all the things a plant will need, your resulting seedlings will definitely be off to a better start!